A quick show of hands around the country probably wouldn’t have Brighton pegged as a particularly good place for a fry-up. For a start we’re too far south and too middle class. But what we have in our favour is that we’re a real party town and what’s the best way to repair the damage the next day? Exactly, a plate piled high with greasy food. We thought it was time to work out which was the best in Brighton. Actually the city’s yoghurt-weaving ways give it another edge over less poncey places – we can get good ingredients here and people understand the benefit of local and organic produce. The wholefood ethic of the muesli mountain dwellers has given our full English breakfasts an interesting edge, and we demand good nosh. So, with all that in mind we weren’t going to settle for any old crap. You lot have been recommending your favourite traditional brekkies for the last month or so and we’ve been sneaking in and giving our verdict. Turns out you know some very good spots indeed – some of which we’d missed completely. As ever we paid for our food to maintain impartiality. At the start we ponder why hardly anyone else seems to do that but then we added up the hundreds of pounds we’d spent. Still worth it, and what we spent in pounds (£) we gained in pounds (lbs). A heavy price – we hope you find the guide useful. We’re off fry-ups for a while now. NB: As none of the Secret Eater team can stomach mushrooms at the best of times, let alone mornings, we asked for them to be removed to see if we were offered a swap. We didn’t ask, and sometimes we didn’t get. Your mileage may vary. It’s worth noting that this feature is a couple of years old. Check out another round up, from 2012, by Rosie Posie. We’ve walked past Seven Bees café loads of time but it’s almost too intimate to go into. But we’re here to tell you to get right in there, if you like fry-ups – Seven Bees do the best in town. For a start it’s a fiver, not a tenner. The one guy (he cooks and serves) gave us a list of the standard items included but added the lovely caveat “or however you want it”. Now that’s customer service. And it didn’t stop there – every ingredient was local, but not shouted about, and tasted great. The perfect amount of toast with real butter, very crispy bacon, chunky, herby, good quality sausage. Our fave element was the latke, a Polish fried potato cake somewhere between a hash brown and onion bhaji, but everything tasted home cooked, and we didn’t feel like we’d overdone it afterwards. Really friendly, it feels like a special secret. Which we’ve just shared with 60,000 people! Mushroom swap out? No, but have it your way if you ask nicely. One disappointing part of the fry-ups we had was that not every café offered to swap the items we didn’t want for something extra. We know it’s a pain in the arse, and that fussy eaters shouldn’t be pandered to, but it’s all part of the game. Lix not only swapped, but did it in style. By ending up with bubble and squeak (which wasn’t even an official swap option but was agreed without complaint) rather than mushrooms, we started carb-o-geddon. 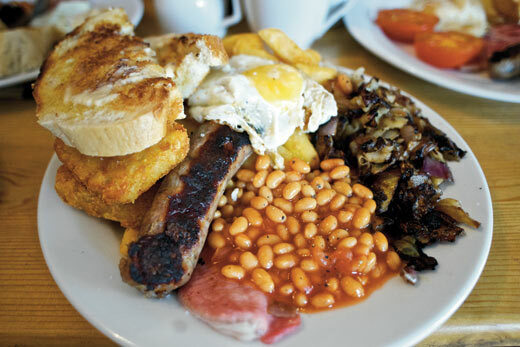 Great slabs of butter-smeared toast, hash browns and chips – a valid breakfast option by the way – had the plate piled high even without the succulent bacon, large farmers sausage and eggs. But the onion, cabbage and potato of the bubble was still worth having – unique and enjoyable – though we couldn’t eat for the rest of the day. Intense, Lix nearly won until Seven Bees just pipped them at the last minute. Mushroom swap out? Oh yes, and we paid a heavy price for it. We’re sure we’ve already bored you with our rule for eating in ethnic restaurants – only eat where people know about the cuisine. So Chinese restaurants filled with Chinese people get our vote. With that in mind Joe’s Café is full of builders. It’s a very good sign, and one that’s backed up with good food and great prices. Despite the low cost Joe sorts you out with bread and butter (or more accurately bread and spread) to nibble on while the brekkie is cooking. Now that’s old school. The main event arrives swiftly, and is traditional but good. Hot, hot beans, perfect, slightly crispy egg, lovely tomatoes and well-cooked bacon with that all important build up that comes from a well used griddle. The tea is massive and comes with the option of being in a mug or a cup – a sophisticated touch that probably comes from Joe’s daughter, who has also seemingly added bunting, decorative jam jars and Cath Kidston catalogues. All of which is at odds with the builders and only made us love Joe’s Café more. How dare they! 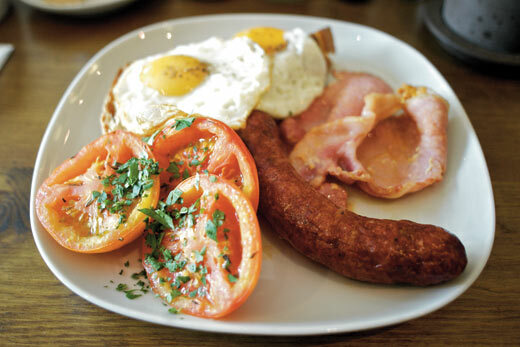 How dare the French come over here and make an English breakfast that is one of the best in Brighton? Fair play to them, Mange Tout have taken a British staple and given it real Gallic flair. For a start the service is charming. Not just sweet, the way some people say that – proper bird-from-trees charming. And the food – that’s equally disarming. A big chunky Toulouse sausage is the centrepiece and it’s the best sausage we had. The bacon was exceptional too – thick, strong flavoured, salty: über-bacon. Eggs come however you want them. We tried fried and they were spot on or thereabouts. There was just one piece of toast, under the eggs, but despite being airy and ciabatta-esque we didn’t feel short changed. The tomatoes were big, juicy, fresh and cooked right through. The only downside is it’s over a tenner with a cup of tea. Mushroom swap out? Spinach offered but we bargained up to tomatoes. 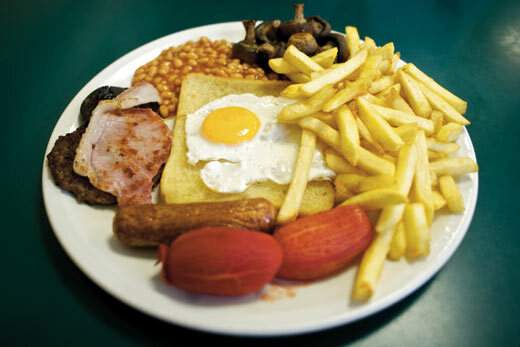 We’re not continental enough for spinach in a fry-up. The clue is in the name here – Harry’s English Restaurant, how could it be anything other than good? What stood out was the strict ethics that Harry’s stick to. Tea was included in the price, item swaps were offered without constraints, coffee gets a free refill and you pay at the end of the meal. It doesn’t sound much but it led to a nice feeling that our custom was valued. It’s good full English etiquette. Food wise, the bacon came in big slabs and was tasty not dry, the eggs had a good runny yolk and the toast was thick and grainy. Perhaps the best element was the tomatoes, which weren’t woody but fresh tasting, soft, juicy and not overwhelmed with flavours. Despite being flagged up as pork and sage, the sausage was surprisingly underwhelming. Overall it was a lovely experience, even though it was busy when we reviewed. Manners cost nothing. Mushroom swap out? Yes, and with a smile. NB: Harry’s has now shut down. The Market Diner was the breakfast you guys recommended most, but we reckon that not many of you have actually eaten it in the cold light of day. You only need to look at the elements to know that this full English (at least in the Gut Buster form we ate it) is made for the end of a night in the pub. Egg, sausage, tomatoes, beans, mushrooms, tea – yeah, all well and good. But burger? Chips? Really this is the perfect mash up of meals when you need to soak up the booze. 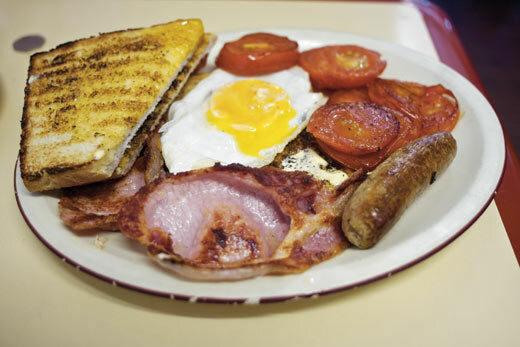 Burger and chips and a fry-up – get in! Tackled in the Star Wars Cantina Bar-like environment of the small hours this works great but it’s a bit old school for when you have your full senses. You don’t need to be thinking too much about the damage fried bread is doing to you. All in all the Market Diner is real, a place to be celebrated. But maybe after nightfall. Mushroom swap out? Yeah, but we swapped them back for deep fried mushrooms. Not sure why. In the run up to this article we thought we’ll get this one down as research. 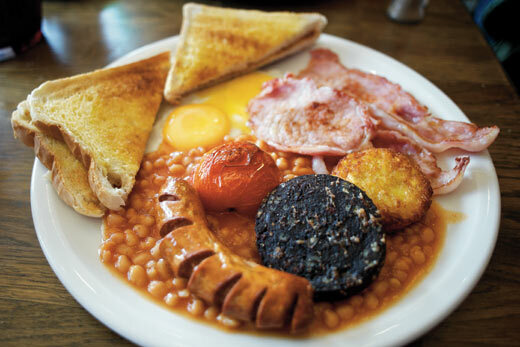 “It’s £8.95!” we thought, “It’s the most expensive fry-up in the world. Let’s ‘business expense’ it.” Turns out we were naïve – full Englishes are frequently proper pricy now. This one wears its cost on its plate, so to speak. In terms of ingredients it’s all the money – local, organic, hand-knitted. It’s even called the Sussex breakfast. Your heart will high-five you for the fact that it’s completely non-greasy – feeling kinda healthy in fact. The tomatoes – clearly on the vine – were full of flavour even before being seasoned with ground black pepper, the sausage was herby and meaty, the toast had a honey-ish taste. Downsides? Well the beans were cold, and the second visit could have benefited from being a bit more charred. Overall though, it’s the perfect treat – don’t waste it on a hangover. Mushroom swap out? Not offered – we did have two eggs though. By far the most recommended fry-up in Kemptown wasn’t a café but was in the other half of a respected deli. That’s not to say that it wasn’t a nice eating environment – oh no. Its dual purpose meant that half the battle was already won because the ingredients were all top notch. The best bit was the big, fat, herby sausages. Real quality ­- and there were two of them. The bacon was crispy without being dry – thick and meaty – while the fried egg maintained a perfectly runny yolk and a crisp bottom from the fat. It’s a fried egg after all. Toast – with real butter – came from nice, grainy bread, but sliced. It may have benefitted from another slice to balance the protein. Tomato – just a small half – tasted great but we thought was a bit stingy, and the beans were a bit cool. Overall a good solid breakfast if you’re in the area. Mushroom swap out? Afraid not. Found in the North Laine, the Dumb Waiter feels like it’s really part of the community. Maybe because it’s got such a nice atmosphere, it’s a really nice place to hang out and people are constantly popping in and chatting with the friendly staff. There’s an interesting array of breakfast options and you can build up your own if you’re one of those fussy/healthy people, though it is more expensive. 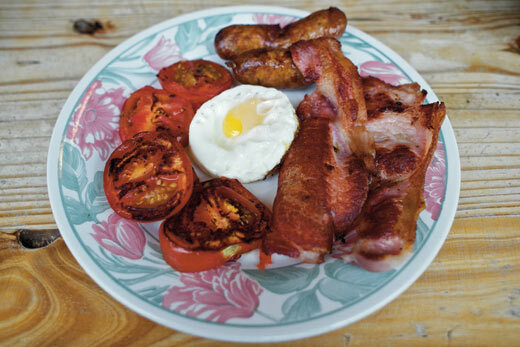 Overall the fry-ups had really strong flavours – especially the very herby sausages, well seasoned tomatoes, and crispy bacon. It’s nice to see fried potatoes as an option and they were good, as was the fried bread, which felt decadent rather than deadly. The egg yolks were a little hard leading to the fry-up feeling a bit dry, but there are plenty of options to balance that out next time. Best enjoyed when you’re feeling sociable and have time to hang out. Mushroom swap out? Forgot to ask until the breakfast was being made but the plate came full so substitutions may have been made. Unlike every other café in this list, there isn’t just one Bystander. We remember there being a handful but now the choice is London Road or Brighton Station where we rock up shortly before midday. Obviously its position requires it to have a swift turnaround from ordering to shovelling it down your neck – you don’t want to miss your train, even for bacon. 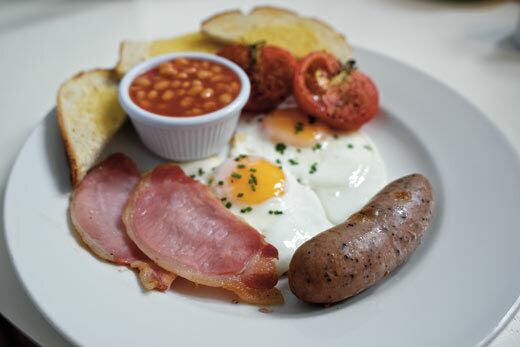 The quickest fry-up ever – it seems to arrive faster than it takes to actually cook the ingredients. The sausage arrived looking fancy but turned out to be deep fried Walls-style but with clever slicing. Loads of beans and half a tomato, the black pudding stood out as a salty highlight but we have to admit that, as the last breakfast we troughed down, this didn’t really inspire our jaded taste buds. If you need a fry-up quick, this is substantial and decent if unexciting. Mushroom swap out? No, there’s no time for messing around when you’re waiting for a train. Since we’re the most vegetarian-friendly city in the UK, it’s much easier to find a decent meat-free fry-up here than anywhere. So if you want to be passive about it, you’ll be fine just hanging with your meat-munching friends wherever they go: every central breakfast joint does a proper meat-free alternative. Our favourite of these is off the beaten track: Café Pause, just up from Preston Circus, two minutes from the Duke Of York’s. They’re not cheap but the veggie breakfast kicks arse, with mushrooms setting a standard. They also have more unusual options such as a middle-eastern plate, eggs Florentine and a gorgeous scramble with goats cheese (or salmon) on a bagel. Their pancakes are the finest we’ve had in Brighton. Or venture to a specialist and drag the carnivores with you: head for the golden triangle on the Kensington Gardens bit of the North Laine where you’ll find, in the space of a few yards, the Dumb Waiter, Wai Kika Mu Kau and Iydea. Wai Kika’s veggie fry is terrific, generous and clean but not too prissy. But for the finest veggie brekkers of all, we currently vote Iydea. Their mix’n’match of homemade items is monumental and tastes like nowhere else, yet they get even the basics perfect: do their own beans, make waffles like bhaji, put avocado in their ‘shroom splodge and offer without doubt the best scrambled eggs in Sussex (apart from ours). Just go early because it gets hectic and the queuing is carnage. 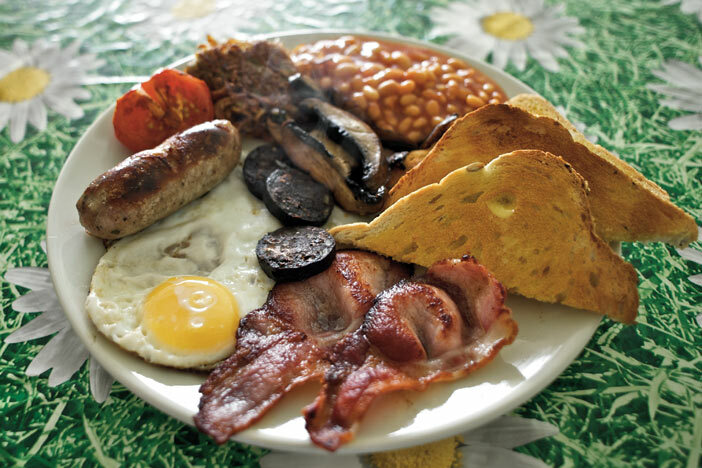 WHY ARE FRY-UPS SO DAMN GOOD FOR HANGOVERS? Raising blood sugar too quickly will give you a short-term lift but leave you knackered later on. Refined carbs do this, so choose wholegrain bread instead of white. 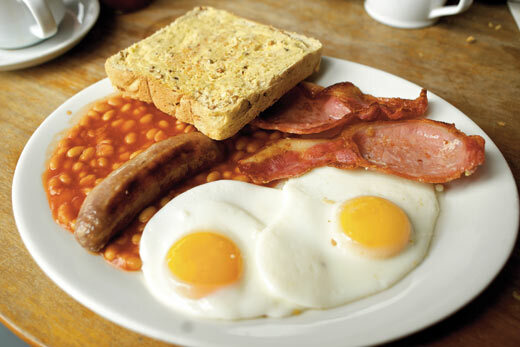 Fry-ups are also a mass of protein, another good blood sugar balancer. The amino acids in protein build neurotransmitters in your pickled brain. Lovely old serotonin is one of these. The more protein you have in relation to carbs, the better you’ll feel, so extra bacon instead of extra toast is best for fighting off that death-warmed-up feeling. 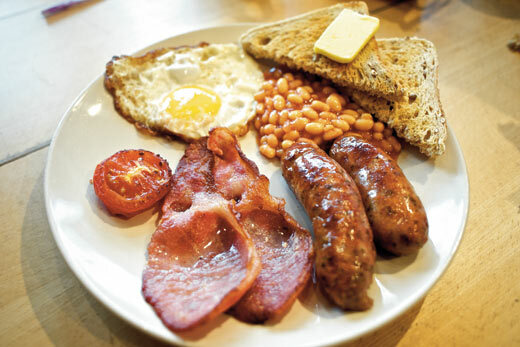 Looking at a belly-busting plateful of fantastic fry-up might seem daunting, but nature’s not just there for the bad things in life like hangovers, it fills the fry-up with fat, salt and sugar so you’ll want to eat loads of it. If leaving the house for the bright sunshine of outside is too much of a challenge, the homemade fry-up is a perfectly acceptable substitute. Go for organic where possible so your liver isn’t mucking about with pesticides, hormones and drugs, leaving it to concentrate on detoxifying that ‘one for the road’ that seemed such a good idea last night.